Believe it or not, this appetizer or light lunch includes an old fashioned recipe from a great American chef. Armenian Flatbread from the “Beard on Bread” cookbook by James Beard, is a cracker-like crunchy vessel that delivers this delicious salad to your mouth. It’s a basic, no-frills flatbread recipe that is just as good broken into soups or stews as it is piled high with arugula, prosciutto, pears, and goat cheese. These flatbread toppings have a fun story as well. They are inspired by a dish from an upscale restaurant I worked at five years ago. I normally prefer fresh figs for this combo but pears are juicier and more accessible this time of year. Each element plays a different role in this dish. 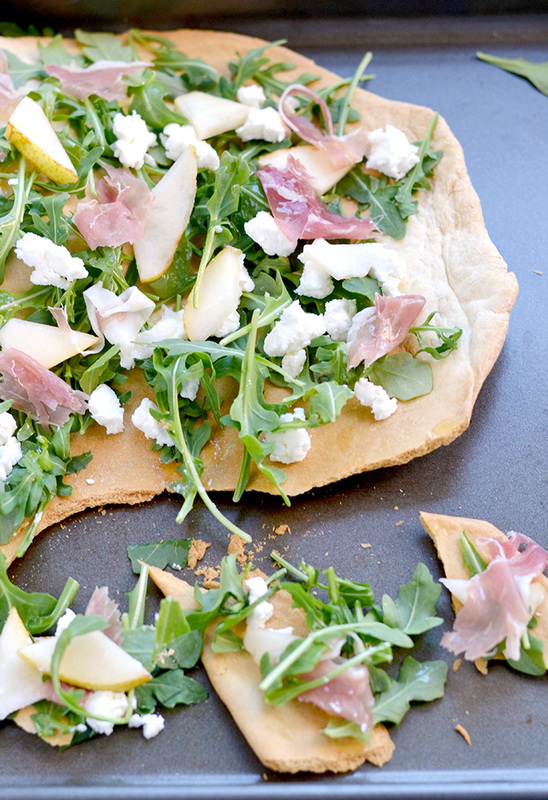 The flatbread adds a crunch (you can use store bought crackers or even soft pita bread – no judgement here), arugula provides a grassy spiciness, goat cheese is smooth and creamy, and the pears are sweet while the prosciutto is salty. The finishing touch is the tart acid from the meyer lemon dressing (regular lemon is fine too). It may be light and arguably healthy but this dish has all 5 of our basic tastes (sweet, salty, sour, bitter, and umami) easily covered. So here’s to a happy and healthy (or at least somewhat) new year! And stay tuned for my deep-fried tripled chocolate covered oreos post next week…just kidding. Pour the warm water in a large warm bowl. Sprinkle in the yeast and stir until dissolved. After it has proofed, add the cooled butter, salt, sugar, and 1 cup flour. Beat until smooth. Add enough additional flour to make a stiff dough. Turn out on a lightly floured board and knead until smooth and elastic, about 8-10 minutes. Place in a buttered bowl and turn to coat. Cover and let rise until doubled in bulk. Punch down dough and divide in two equal pieces. Roll each piece into a rectangle. Place on ungreased baking sheet and bake in a preheated oven for about 20 minutes or until golden brown. Makes 2 flatbreads (roughly 8”x6”). Sprinkle arugula on one of the flatbreads evenly. Tear prosciutto and sprinkle evenly on top. Add about half the sliced pear and dot with crumbled goat cheese. In a small bowl, whisk together the lemon juice, mustard, and honey. Add the oil in a slow stream, whisking constantly until the dressing is well blended. Season with fine salt and freshly ground black pepper to taste.